1. H. Külah and K. Najafi, USPTO 7,579,757, August 25, 2009. 2. A. T. Çiftlik and H. Külah, TR 2011 01665B, August 22, 2011. 3. A. T. Çiftlik and H. Külah, TR 2012 01780B, March 21, 2012. 4. A. T. Çiftlik and H. Külah, EP 2 318 145 B1, May 16, 2012. 5. A. T. Çiftlik and H. Külah, 5170599, Japan, January 13, 2013. 6. A. T. Çiftlik and H. Külah, USPTO 8,480,956, July 9, 2013. 7. A. T. Çiftlik and H. Külah, 5324706, Japan, July 26, 2013. 8. A. Koyuncuoglu, T. Okutucu Ozyurt, and H. Külah, TR 2013 00075B, July 7, 2013. 9. S. Eminoglu and H. Külah, USPTO 8,591,723, November 26, 2013. 1. A. T. Çiftlik and H. Külah, WO/2010/021604, filed in 2009. 2. A. T. Çiftlik and H. Külah, WO/2011/021984, filed in 2009. 3. A. Koyuncuoglu, T. O. Ozyurt and H. Külah, WO/2012/005706, filed in 2010. 4. L. Beker, N. Goksu and H. Külah, International patent application was filed in 2011. 5. S. Ardanuc, O. Zorlu, H. Külah, and T. Akin, International patent application was filed in 2011. 6. H. Ceylan Koydemir, H. Külah, and C. Ozgen, International patent application was filed in 2012. 1. Gary K. Fedder, Junseok Chae, Haluk Kulah, Khalil Najafi, T. Denison, J. Kuang, Stephen R. Lewis “CMOS Based Inertial Sensors,” in Advanced Micro & Nanosystems Volume 2: CMOS-MEMS, Edited by H. Baltes, O. Brand, G.K. Fedder, C. Hierold, J. Kornivk, O. Tabata, Wiley-VCH, 2005., Wiley. 2. H. Külah, “BiyoMEMS Temelli Biyosensörler,” in Biyosensörler: Metodlar, Uygulamalar ve Son Gelişmeler, Ege Üniversitesi, Haziran 2012 (In Turkish). 3. Y. Demircan, G. Yilmaz, and H. Külah, “Electrophoresis and Dielectrophoresis for Lab-on-a-Chip (LOC) Analyses,” in Microfluidic Applications for Human Health, World Scientific Publishers, to appear in 2013. 4. H. Ceylan Koydemir, H. Külah, and C. Ozgen, “Thin Film Biosensors,” in Thin Films and Coatings in Biology, Springer, to appear in 2013. H. Ceylan Koydemir, H. Külah, A. Alp, A. H. Üner, G. Hasçelik and C. Özgen, “A Fully Microfabricated Electrochemical Sensor and its Implementation for Detection of Methicillin Resistance in Staphylococcus aureus,” accepted to IEEE Sensors, 2014. J. Musayev, Y. Adıgüzel, H. Külah, S. Eminoğlu, and T. Akın, “Label-free DNA Detection Using a Charge Sensitive CMOS Microarray Sensor Chip,” accepted to IEEE Sensors, 2014. 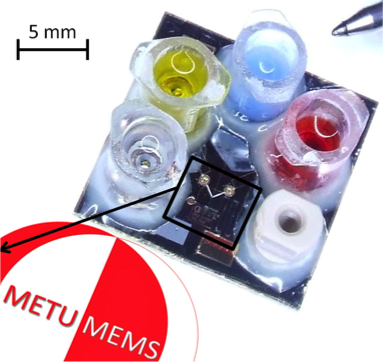 J. Musayev, C. Altıner, Y. Adıgüzel, H. Külah, S. Eminoğlu, and T. Akın, “Capturing and Detection of MCF-7 Breast Cancer Cells with a CMOS Image Sensor,” accepted to Sensors and Actuators A, 2013. L. Beker, Ö. Zorlu and H. Külah, “A Parylene Coating Based Room Temperature Wafer-Level Attachment Method for MEMS Integration with Zero Applied Force,” accepted to Sensors and Actuators A, 2013. H. Ceylan Koydemir, H. Külah, C. Özgen, “Solvent Compatibility of Parylene C Film Layer,” Accepted to JMEMS, 2013. Y. Demircan, E. Özgür, H. Külah, “Dielectrophoresis: Applications and Future Outlook in Point of Care,” Electrophoresis, Vol. 34, pp. 1008-1027, 2013. Ö. Zorlu and H. Külah, “A MEMS Energy Harvester for Generating Energy from Non-Resonant Environmental Vibrations,” Sensors and Actuators A, vol. 202, pp. 124-134, November 2013. M. Pakdemir, D. Ertürkan, H. Külah, İ. Boyaci, C. Ozgen, U. Tamer, “Ultrasensitive and Selective Homogeneous Sandwich Immunoassay Detection by Surface Enhanced Raman Scattering (SERS),” Analyst, RSC, Vol. 137(1), pp. 202-8, 2012. Y. Adiguzel and H. Külah, “CMOS Cell Sensors for Point-of-Care Diagnostics,” MDPI Sensors, Vol. 12, No. 8, pp. 10042-10066; 2012. E. Yildirim, S. Arikan, and H. Külah, “A Normally-Closed Electrostatic Parylene Microvalve for Micro Total Analysis Systems,” Sensors and Actuators A, vol. 181, pp. 81-86, July 2012 . Rahimi, O. Zorlu, A. Muhtaroglu, and H. Külah, “An Electromagnetic Energy Harvesting System for Low Frequency Applications with a Passive Interface ASIC in Standard CMOS,” Sensors and Actuators A, vol. 168, pp. 158-166, 2012. Rahimi, O. Zorlu, A. Muhtaroglu, and H. Külah, “A Fully Self-Powered Electromagnetic Energy Harvesting System with Highly Efficient Dual Rail Output,” IEEE Sensors Journal, Vol. 12, No. 6. June 2012. Koyuncuoğlu, R. Jafari, T. Okutucu-Özyurt, and H. Külah, “Heat Transfer and Pressure Drop Experiments on CMOS Compatible Microchannel Heat Sinks for Monolithic Chip Cooling Applications,” International Journal of Thermal Sciences, Vol.56, pp. 77-85, June 2012. İ. Sarı, T. Balkan, and H. Külah, ” An Electromagnetic Micro Energy Harvester Based on Array of Parylene Cantilevers,” Journal of Micromechanics and Microengineering, Institute of Physics Publishing, 105023, October 2009. S. Sukas, A. E. Erson, C. Sert, and H. Külah, “A parylene based double-channel micro-electrophoresis system for rapid mutation detection via heteroduplex analysis,” Electrophoresis Journal, Wiley-Blackwell, Vol. 29, No. 18, pp. 3752-58, September 2008. Chae, H. Külah and K. Najafi, “A Monolithic Three-Axis Micro-g Micromachined Silicon Capacitive Accelerometer,” IEEE Journal of MEMS, Vol. 14, No. 2, pp. 235-242, April 2005. Chae, H. Külah, and K. Najafi, “A CMOS compatible high aspect ratio silicon-on-glass in-plane micro-accelerometer,” Journal of Micromechanics and Microengineering, Institute of Physics Publishing, Vol. 15, No. 2, pp. 336-345, February 2005. H. Külah, J. Chae, N. Yazdi and K. Najafi, “Noise Analysis and Characterization of A S-D Capacitive Silicon Micro-accelerometers,” IEEE Journal of Solid-State Circuits Vol. 41, No. 2, pp. 352-361, February 2006. Chae, H. Külah and K. Najafi, “An In-Plane High-Sensitivity, Low-Noise Micro-g Silicon Accelerometer with CMOS Readout Circuitry,” IEEE Journal of MEMS, Vol. 13, No. 4, pp. 628-635, August 2004. H. Külah and T. Akin, “A Current Mirroring Integration Based Readout Circuit for High Performance Infrared FPA Applications,” IEEE Trans. on Circuits and Sys. II, Analog and Dig. Signal Proc., Vol. 50, No. 4, pp. 181 -186, April 2003. T. Akin, Z. Olgun, O. Akar, and H. Külah, “An Integrated Thermopile Structure with High Responsivity Using Any Standard CMOS Technology,” Sensors and Actuators Journal A 66, pp. 218-224, April 1998. Y. Demircan, M. Erdem, E. Ozgur, U. Gunduz, and H. Külah, “Determination of Multidrug Resistance Level in K562 Leukemia Cells by 3D-Electrode Contactless Dielectrophoresis,” International Conference on Microelectromechanical Systems (MEMS’14), pp., San Francisco, Ca, USA, Jan. 2014. S. Chamanian, Ö. Zorlu, A. Muhtaroğlu, and H. Külah, ” A self-powered integrated interface circuit for lowpower piezoelectric energy harvesters” accepted to IEEE International Conference on Energy Aware Computing, to be held in Istanbul, Turkey, on December 2013. H. Uluşan, Ö. Zorlu, A. Muhtaroğlu, and H. Külah, “A 180 nm Self-Powered Rectifier Circuit for Electromagnetic Energy Harvesters” accepted to IEEE International Conference on Energy Aware Computing, to be held in Istanbul, Turkey, on December 2013. G. Bahrieh, M. Erdem. E. Özgür, U. Gündüz, and H. Külah, “Dielectric Analysis of Changes in Electric Properties of Doxorubicin Resistant K562 Leukemic Cells Through Electrorotation with 3-D Electrodes” 17th International Conference on Miniaturized Systems for Chemistry and Life Sciences, µTAS, 2013, Freiburg, Germany. G. Bahrieh, H. Ceylan Koydemir, M. Erdem. E. Özgür, U. Gündüz, and H. Külah, “Dielectric Characterization of Imatinib Resistant K562 Leukemia Cells through Electrorotation with 3-D Electrodes” IEEE Sensors Conference, 2013, Baltimore, USA. S. Baghaee, H. Ulusan, S. Chamanian, O. Zorlu, H. Külah and E. Uysal-Biyikoglu, “Towards a Vibration Energy Harvesting WSN Demonstration Testbed” 24th Tyrrhenian International Workshop on Digital Communications – Green ICT (TIWDC), pp.1-6, Genova, Italy, 23-25 September 2013. E. Gelenbe, D. Gesbert, D. Gunduz, H. Külah and E. Uysal-Biyikoglu, “Energy Harvesting Communication Networks: Optimization and Demonstration (The E-CROPS Project)” 24th Tyrrhenian International Workshop on Digital Communications – Green ICT (TIWDC), Genova, Italy, 23-25 September 2013. L. Beker, Ö. Zorlu, N. Goksu, and H Külah, “Stimulating Auditory Nerve with MEMS Harvesters for Fully Implantable and Self-Powered Cochlear Implant,” International Conference on Solid-State Sensors, Actuators, and Microsystems, Transducers’13, pp.1663-1666, Barcelona, Spain, on June, 2013. Y. Demircan, A. Koyuncuoglu, M. Erdem, E. Ozgur, U. Gunduz, and H. Külah, “Detection of Imatinib Resistance in K562 Leukemia Cells by 3D-Electrode Contactless Dielectrophoresis,” International Conference on Solid-State Sensors, Actuators, and Microsystems, Transducers’13, pp.2086-2089, Barcelona, Spain, on June, 2013. E. Erdil, K. Topalli, Ö. Zorlu, T. Toral, E. Yildirim, H Külah, O. A. Civi, “A Reconfigurable Microfluidic Transmitarray Unit Cell,” European Conference on Antennas and Propagation (EUCAP) 2013), Gothenburg, Sweden, on April. 2013. O.L. Nuzumlali, M. Eren, and H. Külah, “A CMOS Based Current-to-Frequency Converter for Current Output Analog Accelerometers,” Proceedings of the ION 2013 Pacific PNT Meeting, pp. 1003-1009, April 2013. L. Beker, H.N. Ozguven and H. Külah, “Optimization of an energy harvester coupled to a vibrating membrane,” SEM 31st Intl. Modal Analysis Conference (IMAC’13), pp. 577-584, Garden Grove, CA on Feb. 2013. L. Beker, Ö. Zorlu, and H. Külah, “A Room Temperature, Zero Force, Wafer-Level Attachment Method for MEMS Integration,” International Conference on Microelectromechanical Systems (MEMS’13), pp. 267-270, Taipei, Taiwan, Jan. 2013. Ö. Zorlu, S. Türkyılmaz, A. Muhtaroğlu, and H. Külah, “An Electromagnetic Energy Harvester for Low Frequency and Low-g Vibrations with a Modified Frequency Up Conversion Method,” International Conference on Microelectromechanical Systems (MEMS’13), pp. 805-808, Taipei, Taiwan, Jan. 2013. C. Musayev, Y. Adıgüzel, H. Külah, S. Eminoğlu, and T. Akin “Cell Detection Using A CMOS Image Sensor With Modified Pixel Structure Suitable For Bio-Chemical Surface Activation,” International Conference on Microelectromechanical Systems (MEMS’13), pp. 267-270, Taipei, Taiwan, Jan. 2013. K. Gharehbaghi, H. Uluşan, Ö. Zorlu, A. Muhtaroğlu and H. Külah, “A fully integrated power management circuit for electromagnetic energy harvesting applications,” IEEE International Conference on Energy Aware Computing, 2012. R. Denker, A. Muhtaroğlu and H. Külah, “Empirical Proof of Concept for TE Generation in Mobile Computers,” IEEE International Conference on Energy Aware Computing, 2012. E. Yıldırım, E. Özgür, H. Külah, “A Dropletbased multi-drug screening system controlled with electrostatic microvalves,” 16th International Conference on Miniaturized Systems for Chemistry and Life Sciences, µTAS, pp. 959-961, 2012, Okinawa, Japan. Y. Demircan and H. Külah, “A Parylene Based Contactless 3D Dielectrophoresis Chip for Continuous Cell Separation, Trapping, and Manipulation Applications,” Microfluidics 2012, p. 109, Heidelberg, Germany, 2012. H. Ceylan Koydemir, H. Külah, C. Özgen, and İ. Tosun, “Effects of Solvents on Dissolution of Photoresist in Parylene Microchannels”, TechConnect World 2012 (Nanotech), Santa Clara, California, 18-21 June 2012. L. Beker, A. Muhtaroglu, H.N. Ozguven, and H. Külah, “Finite element modeling of MEMS piezoelectric energy harvester,” Proc. NSTI Nanotech 2012, vol 2, pp. 633-636, Santa Clara, CA, June 2012. H. Ceylan Koydemir, H. Külah, and C. Özgen, “A Micro Electrochemical Sensor for the Detection of Methicillin Resistance in Staphylococcus aureus”, 22nd Anniversary World Congress on Biosensors, Cancun, Mexico, 15-18 May 2012. R. Denker, A. Muhtaroğlu, H. Külah, “Empirically Based Methodology for Thermoelectric Generation in Notebook Systems,” International Conference on Energy Aware Computing, ICEAC 2011,December 2011, Istanbul. E. T. Topal, Ö. Zorlu, H. Külah, A. Muhtaroğlu, “A Cr-Ni Thermoelectric MEMS Energy Harvester for Low Profile Applications,” International Conference on Energy Aware Computing, ICEAC 2011,December 2011, Istanbul. L. Beker, H. Külah, A. Muhtaroğlu, “Piezoelectric Cantilever Prototype for Energy Harvesting in Computing Applications,” International Conference on Energy Aware Computing, ICEAC 2011,December 2011, Istanbul. L. Beker, Ö. Zorlu, H. Külah, A. Muhtaroğlu, “Hybrid Energy Harvesting From Keyboard,” InternationalConference on Energy Aware Computing, ICEAC 2011, December 2011, Istanbul. S. Turkyilmaz, A. Muhtaroğlu, and H. Külah, “Improved Second Generation Electromagnetic MEMS Energy Scavenger,” International Conference on Energy Aware Computing, ICEAC 2011, December 2011, İstanbul. R. Denker, A. Muhtaroglu, and H. Külah, “Quantification of Thermoelectric Energy Scavenging Opportunity for Microelectronic System Integration,” PowerMEMS 2011. S. Türkyılmaz, Ö. Zorlu, H. Külah, A. Muhtaroğlu, “An Electromagnetic Micro-Power Generator for Low Frequency Vibrations with Tunable Resonance,” Eurosensors XXV, Procedia Engineering, 4-7th September 2011, pp. 729-732, Athens, Greece. A. Rahimi, Ö. Zorlu, A. Muhtaroğlu, H. Külah, “A Compact Electromagnetic Vibration Harvesting System with High Performance Interface Electronics,” Eurosensors XXV, Procedia Engineering, 4-7th September 2011, pp. 215-218, Athens, Greece. U. Sonmez, H. Külah, and T. Akin, ” A Fourth Order Unconstrained ΣΔ Capacitive Accelerometer,” International Conference on Solid-State Sensors, Actuators, and Microsystems (TRANSDUCERS’11), pp. 707-710, June 2011. A. Rahimi, O. Zorlu, A. Muhtaroglu, and H. Külah, “A Vibration-Based Electromagnetic Energy Harvester System with Highly Efficient Interface Electronics,” International Conference on Solid-State Sensors, Actuators, and Microsystems (TRANSDUCERS’11), pp. 2650-2653, June 2011. D. Eroglu, E. Bayraktar, and H. Külah, “A Laterally Resonating Gravimetric Sensor with Uniform Mass Sensitivity and High Linearity,” International Conference on Solid-State Sensors, Actuators, and Microsystems (TRANSDUCERS’11), pp. 2255-2258, June 2011. E. Yildirim, H. Külah, and M. A. S. Arikan, “An Electrostatically Actuated Parylene Microvalve for Lab-on-a-Chip Applications,” International Conference on Solid-State Sensors, Actuators, and Microsystems (TRANSDUCERS’11), pp. 250-253, June 2011. E. Bayraktar, D. Eroglu, A. T. Ciftlik, and H. Kulah, “A MEMS Based Gravimetric Resonator for Mass Sensing Applications,” Accepted to Micro Electro Mechanical Systems (MEMS), 2011 IEEE 24th International Conference, January 23-27 2011. S. Turkyilmaz, H. Külah, and A.Muhtaroglu, “Design and Prototyping of Second Generation METU MEMS Electromagnetic Micro-Power Generators” International Conference on Energy Aware Computing 2010, December 2010. S. Turkyilmaz, H. Külah, and A.Muhtaroglu, “A Development Tool for Design and Analysis of MEMS Based EM Energy Scavengers” International Conference on Energy Aware Computing 2010, December 2010. E.T. Topal, H. Külah, and A.Muhtaroglu, “Thin Film Thermoelectric Harvesters for MEMS Micropower Generation,” International Conference on Energy Aware Computing 2010, December 2010. H. Töreyin, E. Topal, ve H. Külah, “A multi-source micro power generator employing thermal and vibration energy harvesting,” Procedia Engineering, vol. 5, 2010, ss. 1176-1179. O. Zorlu, E.T. Topal, and H. Külah, “A Mechanical Frequency Up-Conversion Mechanism for Vibration Based Energy Harvesters,” IEEE Sensors Conference, pp. 1366-1369, October 2009. E. Yıldırım, A. Koyuncuoglu, and H. Külah, ” An Electrostatic Parylene Microvalve for Controlling In-Plane Flow,” Accepted to 13th International Conference on Miniaturized Systems for Chemistry and Life Sciences, µTAS 2009, October 2009. G. Yılmaz, A.T. Çiftlik, and H. Külah, “A Dielectrophoretic Cell/Particle Separator Fabricated By Spiral Channels And Concentric Gold Electrodes,” International Conference on Solid-State Sensors, Actuators, and Microsystems (TRANSDUCERS’07), pp. 73-76, June 2009. B. Boga, İ. E. Ocak, H. Külah, and T. Akin “Modeling Of A Capacitive Σ-Δ MEMS Accelerometer System Including The Noise Components and Verification With Test Results,” International Conference on Microelectromechanical Systems (MEMS’09), pp. 821-824, Jan. 2009. İ. Sarı, T. Balkan, and H. Külah, “A Hybrid Silicon-On-Glass (SOG) Lateral Micro-Accelerometer with CMOS Readout Circuitry,” International Conference on Microelectromechanical Systems (MEMS’09), pp. 1075-78, Jan. 2009. R. Kepenek, İ. E. Ocak, H. Külah, and T. Akin “A µg Resolution Microaccelerometer System with A Second-Order Σ-Δ Readout Circuitry,” IEEE Ph.D. Research in Microelectronics and Electronics (PRIME) Conference, Istanbul, June 2008. İ. Sarı, T. Balkan, and H. Külah, “A Micro Power Generator with Planar Coils on Parylene Cantilevers,” IEEE Ph.D. Research in Microelectronics and Electronics (PRIME) Conference, Istanbul, June 2008. İ. Sarı, T. Balkan, and H. Külah, “An Energy Harvesting MEMS Frequency Detector,” IEEE Sensors Conference 2007, pp. 1460-1463, October 2007. İ. Sarı, T. Balkan, and H. Külah, “Design and Optimization of an Electromagnetic Micro Energy Scavenger with Parylene Cantilevers,” PowerMEMS Conference 2007, pp. 745-746, November 2007. İ. Sarı, T. Balkan, and H. Külah, “A Wideband Electromagnetic Micro Power Generator for Wireless Microsystems,” International Conference on Solid-State Sensors, Actuators, and Microsystems (TRANSDUCERS’07), pp. 275-278, June 2007. T. Akın and H. Külah, “MEMS and Microsystem Technologies for Microsensors and Biological Microdevices,” 7th Workshop on Biosensors and Bioanalytical µ-Techniques in Environmental and Clinical Analysis,” In CD-ROM, September, 2006. S. Sukas and H. Külah, “Modeling, Design and Implementation of a Parylene Based Micro-Electrophoresis System,” 7th Workshop on Biosensors and Bioanalytical µ-Techniques in Environmental and Clinical Analysis,” In CD-ROM, September 2006. J. Chae, H. Külah, and K. Najafi, “Micromachined Acceloremeters for Inertial Navigation Applications,” SAE World Congress, “Military Vehicle Technology – Micro/Nano-technology”, pp. 1898-1904, April 2005. H. Külah and K. Najafi, “An Electromagnetic Micro Power Generator for Low-Frequency Environmental Vibrations,” SAE World Congress, “Military Vehicle Technology – Micro/Nano-technology”, pp. 1894-1897, April 2005. N. Yazdi, H. Külah and K. Najafi, “Precision Readout Circuits for Capacitive Microaccelerometers,” IEEE Sensors 2004, pp. 28-31, October 2004. H. Külah and K. Najafi, “An Electromagnetic Micro Power Generator for Low-Frequency Environmental Vibrations,” International Conference on Microelectromechanical Systems (MEMS’04), pp. 237-240, January 2004. K. Najafi, J. Chae, H. Külah, and G. He, “Micromachined Silicon Accelerometers and Gyroscopes,” Invited paper, IEEE/RSJ International Conference on Intelligent Robots and Systems (IROS 2003), pp. 2353-2358, October 2003. H. Külah, J. Chae and K. Najafi, “Noise Analysis and Characterization of A S-D Capacitive Silicon Micro-accelerometers,” International Conference on Solid-State Sensors and Actuators (TRANSDUCERS’03), pp.92-95, 2003. J. Chae, H. Külah, and K. Najafi, “A Monolithic 3-Axis Silicon Capacitive Accelerometer with Micro-g Resolution,” International Conference on Solid-State Sensors and Actuators (TRANSDUCERS’03), pp. 81-84, 2003. H. Külah, J. Chae, N. Yazdi, and K. Najafi, “A Multi-Step Electromechanical Sigma-Delta Converter for Micro-g Capacitive Accelerometers,” International Solid-State Circuits Conference (ISSCC 2003), pp. 202-203, Feb. 2003. J. Chae, H. Külah, and K. Najafi, “An In-plane High-Sensitivity, Low-Noise Micro-G Silicon Accelerometer,” International Conference on Microelectromechanical Systems (MEMS’03), pp. 466-469, Jan. 2003. H. Külah and K. Najafi, “A Low Noise Switch-Capacitor Interface Electronics for High Performance Sub-Micro Gravity Accelerometers,” European Solid-State Circuits Conference ESSCIRC’02, pp. 635-639, Sept. 2002. H. Külah, A. Salian, N. Yazdi, and K. Najafi, “A 5V Closed-Loop Second-Order Sigma-Delta Micro-G Micro Accelerometer,” Hilton Head 2002, Solid-State Sensors & Actuators Workshop, pp. 219-222, 2002. J. Chae, H. Külah, and K. Najafi, “A Hybrid Silicon-On-Glass (SOG) Lateral Micro-Accelerometer with CMOS Readout Circuitry,” International Conference on Microelectromechanical Systems (MEMS’02), pp. 623-626, Jan. 2002. A. Salian, H. Külah, N. Yazdi, G. He, and K. Najafi, “A High-Performance Hybrid CMOS Microaccelerometer,” Hilton Head 2000, Solid-State Sensors & Actuators Workshop, pp. 202-205, June 2000. H. Külah, N. Yazdi, and K. Najafi, “A CMOS Switched-Capacitor Interface Circuit for an Integrated Accelerometer,” 43rd MIDwest Symposium on Circuits and Systems (MWSCAS 2000), pp. 252-255, 2000. A. Salian, H. Külah, N. Yazdi, G. He, and K. Najafi, “A Hybrid Silicon Microaccelerometer System with CMOS Interface Circuit,” 43rd MIDwest Symposium on Circuits and Systems (MWSCAS 2000), pp. 248-251, 2000. J. Chae, H. Külah, A. Salian, and K. Najafi, “A High-Sensitivity Silicon-On-Glass Lateral Micro-g Microaccelerometer,” Third Annual Micro/NanoTechnology Conference, January 2000. H. Külah and T. Akin, “An Infrared FPA Readout Circuit Based on Current Mirroring Integration,” SPIE AeroSense Symposium, Infrared Technology and Applications XXV, pp. 778-788, April 1999. H. Külah and T. Akin, “A CMOS Current Mirroring Integration Readout Structure for Infrared Focal Plane Arrays,” European Solid-State Circuits Conference ESSCIRC’98, pp. 468-471, Sept. 1998. Z. Olgun, O. Akar, H. Külah, and T. Akin, “An Integrated Thermopile Structure with High Responsivity and Detectivity in Any Standard CMOS Technology,” International Conference on Solid-State Sensors and Actuators (TRANSDUCERS’97), pp. 1263-1266, June 1997. 1. H. Ceylan Koydemir, H. Külah, C. Özgen, “Thin Film Biosensor for Electrochemical Detection of Hybridization of DNA”, 10. National Chemical Engineering Congress, İstanbul, 3-6 September 2012. 2. H. Ceylan Koydemir, H. Külah, C. Özgen, A. Alp, G. Hasçelik, “MEMS Based Micro Electrochemical Sensor for Detection of MRSA”, 7th National Molecular and Diagnostic Microbiology Congress, Ankara, 5-8 June 2012. 4. Y. Adiguzel and H. Külah, “Microelectromechanical Systems Based Products for Point-of-Care Diagnostics,” XXIII. National Biochemical Congress, Turkey, 2011. 6. D. Ertürkan, H. Külah, C. Özgen, A. Alp, ve G. Hasçelik, “The Detection of Staphylococcal Enterotoxin B (SEB) Based on Thiolated Antibodies by Atomic Force Microscopy (AFM),” NanoTR VII, 2011. 7. D. Ertürkan, H. Ceylan Koydemir, H. Külah, and C. Özgen, , “MEMS Tabanlı Biyosensörler için Geliştirilen Protokol Kullanılarak Candida Albicans Saptanması,” Otomatik Kontrol Türk Milli Komitesi Otomatik Kontrol Ulusal Toplantısı, 2011. 8. H. Külah, “MEMS and Microsystem Technologies for Microsensors and Biological Microdevices,” NanoTR VI, 2010. 9. H. Ceylan, H. Külah, A. Alp, G. Hasçelik, C. Özgen, “MEMS Tabanlı Elektrokimyasal Biyosensör Tasarımı ve Üretimi,” sayfa 45-46, 9. Ulusal Kimya Mühendisliği Kongresi, Ankara, 2010. 11. E. Yıldırım, A. Koyuncuoğlu, and H. Külah, “An electrostatic parylene microvalve for lab-on-a-chip applications,” in Biomedical Engineering Meeting (BIYOMUT), 2010 15th National, pp. 1-4, 2010. 13. H. Ceylan, H. Külah, C. Özgen, A. Alp, G. Hascelik, “MEMS Tabanlı DNA Biyosensör ile Bakteriyel DNA Saptaması,” Otomatik Kontrol Türk Milli Komitesi Otomatik Kontrol Ulusal Toplantısı, İstanbul, 2009. 14. G. Yilmaz, E. Bayraktar, H. Külah, “BiyoMEMS Uygulamaları icin Kaotik Mikro Karıştırıcı Tasarımı ve Üretimi,” 14. Biyomedikal Mühendisliği Ulusal Toplantısı, BIYOMUT 2009, pp. 1-4, İzmir, Mayıs 2009. doi: 10.1109/BIYOMUT.2009.513026. 16. Z. Olgun, O. Akar, H. Külah and T. Akin, “Thermopile Type Infrared Detectors Implantable In Any Standard CMOS Technology (In Turkish),” Digest, National Conf. Of EMO (Electrical Engineers Chamber), pp. 75-78, Sep. 1997. 17. H. Külah and T. Akin, “Design Of A PtSi Schottky-Barrier Infrared Detector With Its CMOS Readout Circuitry (In Turkish),” Digest, National Conf. Of EMO (Electrical Engineers Chamber), pp. 79-83 Sep. 1997. 1. H. Kulah and K. Najafi, “A Low Noise Switched-Capacitor Interface Electronics for Sub-micro Gravity Resolution Micromachined Accelerometers,” 3rd Place Award (Operational Category), Design Automation Conference 2002, New Orleans, Louisiana, June 2002. 2. M. McCorquadale, A-C. Wong, K. Nagarajan, H. Kulah, and C.T-C. Nguyen “An Integrated MEMS BiCMOS SINCGARS Transceiver,” Best paper and 1st Place (Conceptual Category) Awards, Design Automation Conference 2000, Los Angeles, California, June 2000. 3. H. Kulah and T. Akin, “A High Performance Readout Electronics for Infrared Focal Plane Array Applications,” 3rd Place Award (Operational Category), Design Automation Conference 2000, June 2000. 4. H. Kulah and T. Akin, “PtSi Schottky-Barrier Infrared Detector with CMOS Electronic Circuitry (In Turkish),” Kaynak Elektrik Dergisi (National periodical on electronics), pp. 103-113, Feb. 1997, Best paper award by IEEE-PES Turkey. 1. H. Kulah “Closed-Loop Electromechanical Sigma-Delta Microgravity Accelerometers,” Ph.D. Thesis, Dept. of Electrical Eng. and Computer Sciences, University of Michigan, Feb. 2003. 2. H. Kulah, “A CMOS Integrated PtSi Schottky-Barrier Infrared Detector for Night Vision Applications,” M.Sc. Thesis, Dept. of Electrical and Electronics Engineering, METU, July 1998.